Avengers: Infinity War has two new TV spots that features Tony Stark officially welcoming Peter Parker to the Avengers and some never-before-seen moments of Vision, as well as Doctor Strange fighting alongside Iron Man. The new footage dropped unexpectedly today and also shows some more footage of Star-Lord and the Guardians of the Galaxy. It's been an exciting few weeks for Marvel fans with the release of the second full-length trailer and the release of pre-sale tickets. And now, fans have been treated to a few TV spots that both show the beginning of the next phase of the Marvel Cinematic Universe. Chris Pratt's Star-Lord is one of the first images shown in one of the new Infinity War TV spots, where he says, "This might be dangerous, so let's put on our mean faces." This might be one of the biggest understatements ever uttered in an MCU project. The rest of the short trailer shows off some intense action, which is a mix of the footage that we've seen thus far with tiny differences. However, one big difference is a new scene where Tony Stark welcomes Peter Parker to the Avengers. "We're going to need some help. Alright kid, you're an Avenger now." Spider-Man was going to join the Avengers at the end of Homecoming, but Peter Parker decided to stay back and help out the neighborhood. However, Thanos is out to prove himself in Infinity War, and it really looks like the Avengers can use any help that they can get. The new TV spot goes a long way in adding to the hype for the upcoming Marvel movie, which many didn't even believe was possible. Spider-Man has been featured heavily in all of the footage for Infinity War released to date. We've seen Peter Parker on the school bus with his Spidey-Sense tingling along with some footage of Spider-Man scaling Thanos' Q-Ship as it hovers over New York City, which then sees Iron Man rocketing to his assistance. Black Panther has also been featured prominently along with the rest of the established Avengers in the all-out war against Thanos. The shape of the Marvel Cinematic Universe will reportedly look a lot different after Thanos is finished with his quest to locate all of the Infinity Stones. The new footage from another one of the TV spots shows off some more of Doctor Strange being tortured and Vision telling Scarlet Witch, "We are... out of time." Infinity War is one of the most anticipated movies in history, never mind comic book movie history. Guardians of the Galaxy director James Gunn recently saw the movie and was blown away while Chris Pratt calls it the "biggest movie ever," which might not be hyperbole at the moment. Not only will Infinity War bring together an unprecedented number of superheroes into one movie, but it's looking like it's going to decimate the summer box office and break some all-time records in the process. Infinity War opens on April 27th, which is only about a month away at this point. 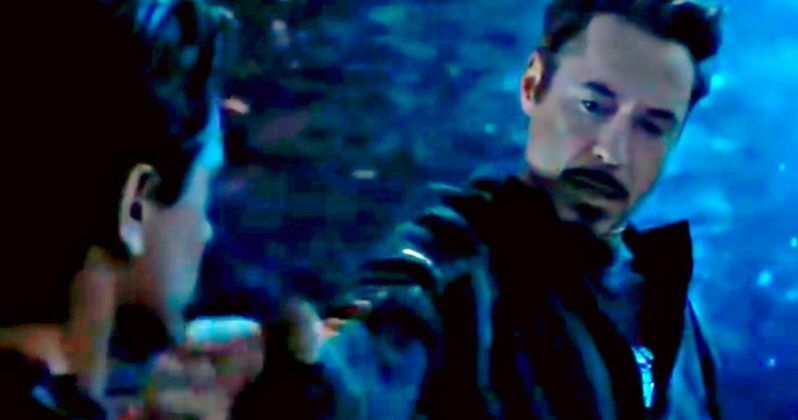 Until then, check out Tony Stark welcoming Peter Parker to the Avengers in the new Infinity War TV spot below as well as some new footage of Vision and Doctor Strange, courtesy of The Marvelous Realm's Twitter account.